This dwarf Pelargonium (called Geranium) is shorter than a paperback (I mean not as tall) and the leaves are correspondingly small. A perfect little miniature plant with all the habits and leaf colouring of a zonal Pelargonium. I guess you could grow them outside in summer in the rockery after the Aubretia and spring flowers have finished or in pots indoors and out.. I have several cuttings coming along very nicely that I took from this plant in March as I wanted to reshape it for this summer and couldn’t waste the trimmings. I used gritty compost and a normal window ledge and all 6 have rooted. 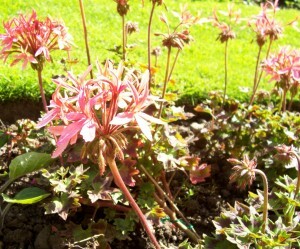 I will cut them back in Autumn for growing slowly onward next spring. 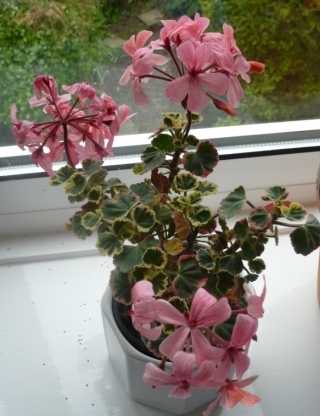 I am looking for other miniature Geraniums to complement this one as they are easier to maintain in good condition than the larger varieties. 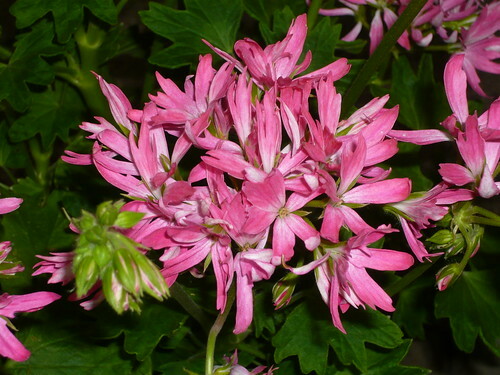 The following varieties are suitable for exhibitions and I might give one or two a try; Dibbinsdale, Dovepoint, Barnsdale and Clatterbridge according to Fir Trees nursery where I buy my Pelargoniums.